My next planned event will be October 31st at Marina. I am not quite sure if I’ll be able to attend this, though. I would like to, but work currently has plans to send me to China for training for one or two weeks. Hopefully I will be back in time for round 2! To anyone that has ever wanted to try autocrossing, please don’t be shy! Autocrossing is one of the most accessible forms of motorsports out there. You only need a street safe car and a driver’s license. It is a great way for you to enjoy your car and racing without the huge financial sting that other disciplines require. The Impreza is holding together just fine. I need to rethink how I use the tires. The tires are currently “rolling” over and are wearing unevenly on the outside edge. I think for the next event, I’ll run a little higher pressure. This might affect the overall grip, but I think it will allow the car to feel a little sharper in the turns. I really love this car. I really do! It certainly isn’t in its prime any more, but it is still really fun to drive. It isn’t pushing as much power as it use to, but boy does it have a ton of grip, and it still seems really easy to drive. Rarely do I get the chance to watch other people drive my car, but watching it go is quite a treat. I can’t really describe it. All I can say is that it looks really light, agile, and smooth. And even though it has been awhile, and the shocks are not what they are used to, it still looks like the car runs and rotates well. There are only several more events for the year. My plans for the rest of season is to hopefully make a few improvements. I am not quite sure what I am trying to improve, but hopefully I will figure that out as I drive more. My other goal is to share the sports with my friends and family. Autocrossing is always more fun among good company. I always get a lot of resistance from newer people. I always remind them that the most important thing is to have fun. If they don’t have fun, then why do it? My hope is that I will be able to utilize the Impreza to learn something new about my driving style. I believe that there is more time to be trimmed in the Impreza. I think a lot of that lies in the execution of my runs. That is… carrying a quicker pace through slaloms, getting closer to cones in turns, and getting on the throttle earlier and more often than I am now. After driving the Impreza for 3 or 4 events, I am starting to appreciate these smaller improvements. Prior to my hiatus, I was struggling and frustrated to make improvements. Now, I am starting to understand the diminishing returns. I failed to grasp the actual weight of a few tenths. I spoke with Ben last event and he made a very good point. He shared that his only goal for the day is to put down faster times as he does more runs. If he does that, it is a successful day. I think that is all for now. Hope everyone has a great weekend! 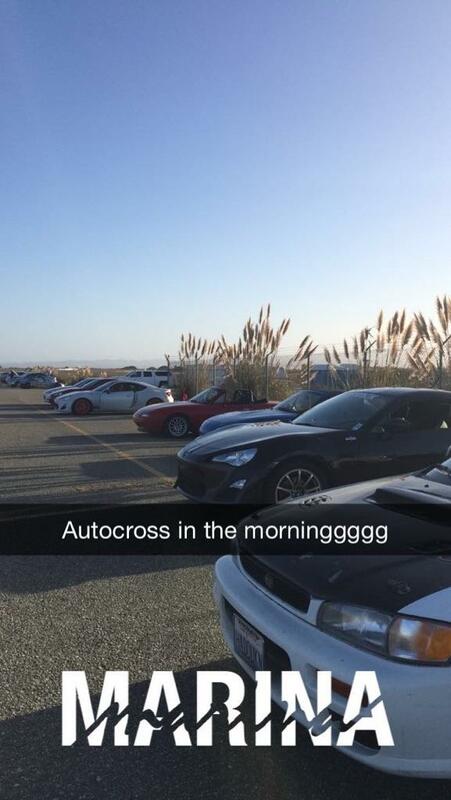 SFR SCCA Solo Slush Round 1 – 10-04-2015 – Marina, CA – Picture: Melanie K.
Another autocross in the books. First, the weather was just beautiful. Not too hot, and not too cold. just perfect enough to wear a light sweater or jacket. After the Lotus Club event two weeks ago, I definitely welcome the change in temperature. I love the fall and the cooler weather. There’s something soothing and relaxing about it. Anyways… We brought the Impreza out to Marina again. Melanie drove her third autocross ever today and she’s really starting to develop as a driver. Me on the other hand… well, I am still trying to figure that part out. The course was just awesome today. Kudos to Josh Salvage on a very nice course. Check out the video below. It all flowed really well, and was super beginner friendly. Kudos to everyone who helped out today at the event. We were done before noon and off-site and having lunch at 12:15. Food was kind of mediocre, but otherwise, it was decent. I’ll have to share my Yelp review when I get around to writing it. Kudos to Melanie on a strong performance on her third autocross ever! Especially in the Impreza!